Become a “fan” of any of Doula UK’s official Facebook page. “Follow” the official Doula UK Twitter handle. “Like” a status update or an article posted to our Facebook page. If you have comments or concerns you wish to raise in relation to Doula UK business we ask that you direct these to your Regional Rep, Rep Co-Ordinator or to a member of the Leadership Team. Post any content that looks, feels or sounds like or can be mistaken for an official Doula UK statement. Discuss any non-public or confidential information about Doula UK. 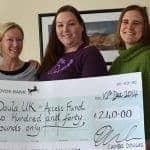 Respond to or comment on posts about Doula UK that are made by bloggers, reporters, customers or the general public on official Doula UK Social Media sites (e.g. Twitter, Facebook) or on third-party sites, even if such posts are inaccurate or critical of the organisation. Participate in developing any Wikipedia content concerning Doula UK. Discuss clients or matters relating to them on any social media site whether ‘personal’ or ‘doula related’. Disparage colleagues or others you work with in your role as a doula on any social media site whether ‘personal’ or ‘doula related’. Forward or post any internal communications, including e-mails, e-News, memos or any documents posted our Online Forum. If it is deemed you have breached these guidelines you may be subject to our disciplinary procedure.